PS: I’m loving this pattern! How come the cuffs don’t match? Very nice! Any tips for carrying the yarn? I started a swatch for a sock in which I carry one color behind 3 stitches (a slip-stitch mosaic pattern) and I’m unsure of how stretchy they will be. any chance I’m your pal?! ;) they look great. Those are turning out rather lovely aren’t they? I would love to be your receiver. they look great! Those are wonderful. Pity I didn’t join so there is no chance they are coming to me. I love the way the cuffs are different colours! Very cute. Asymmetry! They’re great! You’ve got a lucky pal. Very nice! 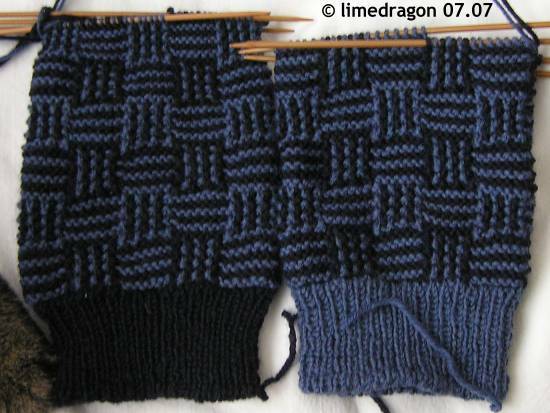 A Hogwarts KAL? I am so out of the loop! Did you get ‘Charmed knits’? Did you see some of the incredible fiber things in movie #5? Those are great socks!! i love the pattern on them and the different cuffs are a great touch. great socks!! i love that they’re opposites. I don’t think I’m your pal. :-( But those are gorgeous! I’d be in love with them. Oh, very cool! I want to make the Crusader’s Cross mosaic socks one of these days.